As much as I’d like to see Alex Leapai become the first Australian in history to win the Heavyweight title, he has some task to overcome in Wladimir Klitschko. Klitschko has been undefeated since 2004 and his resume lists a host of former World Champions including Samuel Peter, Chris Byrd, Lamon Brewster, Hasim Rahman, Ruslan Chagaev, Jean Marc Mormeck, Alexander Povetkin and David Haye. Boxing experts are give Leapai a “punchers chance” of victory , meaning that given his destructive power, if the Australian lands flush, there’s a good chance that he’ll knock Klitschko out. The big problem is landing that punch. The boxing world has been crying out for someone to shake up the Heavyweight division, with both Wladimir and Vitali Klitschko having a monopoly on the weight class for several years. Vitali is now retired and embarking on a political career in his native Ukraine, but the pair have long been criticised for a lack of excitement in their fights, with both known for simply getting behind their jab and recording shutout points victories. It’s a scientific approach that has won them countless world titles, but hasn’t exactly won them admirers in the boxing world. In days gone by the spotlight had always shined brightest on the Heavyweights, but these days the headlines go to the lesser weight divisions, such as welterweight, the home of Floyd Mayweather and Manny Pacquiao. The boxing public have anointed several fighters as ‘the one’ to breakdown the Klitschko monopoly, but up until this point, all have failed. David Haye looked like the man best credentialed to complete the mission, with the former undisputed Cruiserweight champion stepping up to Heavyweight looking to counter the Klitschko’s. Haye is an all-round fighter with all the tricks. He can box when he needs to; he can fight on the inside and has brutal knockout power. He is a multi-dimensional fighter, who can adapt to different situations, as he showed in defeating the 7ft Nikolay Valuev in twelve patient rounds, before following it up with crushing knockouts of former Heavyweight champion, John Ruiz and Olympic gold medallist, Audley Harrison. But when Haye met Wladimir Klitschko in their much anticipated fight in 2011, Haye was lucky to win a round. 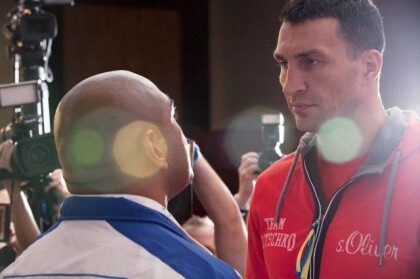 Whilst Haye blamed a broken toe for the poor performance, it was clear Klitschko had his number. Haye was largely ineffective and despite a few short flurries, never looked liked having Wladimir in trouble. It was a typical Klitschko performance, with Wladimir again using his jab to dictate terms. Haye struggled to get on the inside and land any real shots of note and I expect Leapai to experience similar problems. To break down the Klitschko defence you need to present an all-action style. You need to punch first and fight with considerable risk to get on the inside and get your shots away. You cannot attack by loading up single shots, something that Leapai will often do in fights. Tactics like that won’t work against a guy who hasn’t been knocked out for over ten years and just three times in 61 fights. Getting Klitschko to engage is also an issue. As he has shown countless times, he’s happy getting behind his jab and using it to win rounds. It’s a cautious approach, but one that is no doubt effective. Wladimir is an outstanding technical fighter, built from a strong amateur base, where he won Olympic gold before becoming the undisputed heavyweight champion, and whilst there are chinks in every fighters armour, finding one in a Klitschko is easier said than done. For Leapai, beating Klitschko is a giant task, literally. The Australian will give away six inches in height and reach to 38-year-old Ukrainian. Leapai has beaten the best there is on a domestic level, with wins over Bob Mirovic, Colin Wilson, Pieter Cronje and Michael Kirby but has never fought anyone in the class of Klitschko. Leapai’s best performance to date was in his most recent fight against Denis Boytsov, a man who came into the fight undefeated in 33 career fights. Leapai was given little chance before that one as well, but it wasn’t just the fact he won the fight that impressed, it was the manner in which he did it. Leapai boxed his way to victory, winning comfortably on points and showing he is more than just the knockout artist that many expect. Whilst Leapai has knockout power and a vicious hook, he needs to setup these punches, rather than look for a one punch knockout against Klitschko. He must jab his way to the inside then let them go. If he lands, its goodnight, but getting through the Klitschko defence to land the shot is another story in itself. It will take more than one punch to slay the giant. Betting markets have Leapai as much as $8 to win the fight and even the man himself says victory will be a story similar to that of movie great “Rocky Balboa”. But if Leapai needs inspiration, he doesn’t have to reach for the in-room movie channel, he only needs to look to fellow Australian, Jeff Harding, who shocked the world some 24 years ago. No one gave Harding a chance going into his fight with Dennis Andries in Atlantic City, but the Australian stunned the world with a final round stoppage taking home the gold in just his fifteenth career fight. It’s been 106 years since an Australian has fought for the Heavyweight title, and if Alex Leapai shocks the world on Sunday, it’ll be worth the wait.